Want to add some foliage plants to your home or office? Here are three that are readily available and relatively easy to grow. This lush, tropical plant is an evergreen with glossy, dark green leaves. They are often grown in large containers, but smaller versions are available. 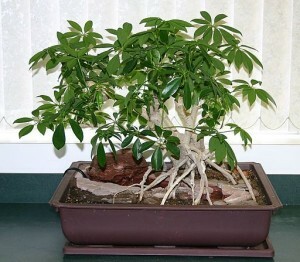 The Schefflera is also referred to as an “umbrella tree.” They require bright but indirect light. Grow them in a soil-based or standard potting mix. Schefflera grow best in temperatures ranging from 65 to 80 degrees and are easily damaged by drafts from air conditions, heaters, radiators or open doors. Wait until the soil dries out before watering, then give it a good soaking. Yellow leaves are a sure sign that your schefflera is getting too much water. The hallmark of this bold evergreen is its large, leathery leaves. The rubber plant is easy to grow and adapts well to a variety of conditions. As you can imagine, this plant gets its name from the sap that dries into (no kidding!) a low quality rubber. The rubber plant prefers bright, indirect light. This is another houseplant that will tell you with its yellow leaves that it is being overwatered. During the growing season, keep the rubber plant moist, but during the winter, cut back watering to just once or twice a month. Remove dust that collects on the broad leaves often, with a damp cloth. If your plant develops water stains from this process, add a tiny amount of hand soap to the cleaning water. Leaf shine sprays can keep the leaves extra shiny and make the plant picture-perfect. This is a slow growing plant that can reach two to three feet when grown indoors. The jade plant needs a quick draining and sandy soil, so opt for the potted soil for cacti and succulents. Its thick, fleshy leaves thrive in bright light and warm temperatures; never cooler than 50 degrees. Protect the jade plant from winter’s cool drafts by moving it away from windows. Keep the jade evenly moist but never soggy, or its roots will rot. Water thoroughly, then let it dry out a bit—as long as two to four weeks—before re-watering. Signs of too little water include leaf shriveling and brown spotting and stunted growth. To train the plant to grow taller, prune the lower leaves. Dust or mist the leaves regularly to keep the plant healthy; dust suffocates the jade plant’s leaves.